Vegetable gardens come in all shapes and sizes. There was a time when people simply had "a garden." Vegetables and flowers were chosen for their usefulness and intermixed in one garden, a cottage garden that was often in the front yard. 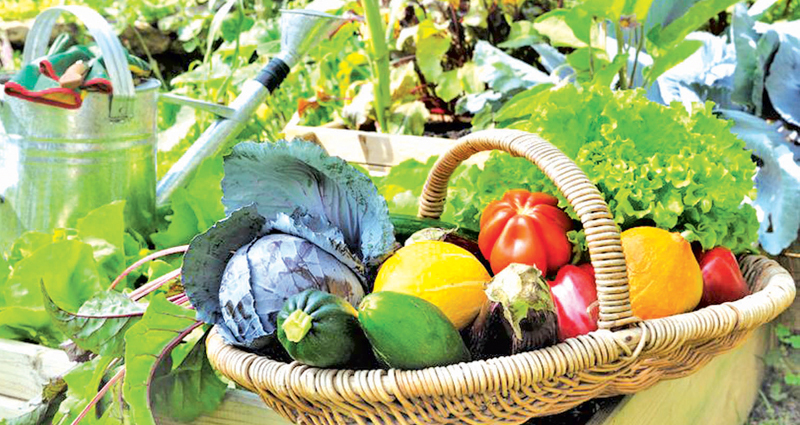 Now vegetable gardens can be just as creative and attractive as ornamental flower gardens. Why not create a conversation piece as well as a productive little vegetable patch? Here, an old set of drawers finds a new purpose as a planter when arranged on a ladder-like structure. The drawers are deep enough to grow most vegetables and there's even room for a small tomato cage. Some vegetables are too beautiful to be confined to the vegetable garden. Show them off by making them focal points in your garden. Think how beautiful Strawberry pots will be when they fill out. And as you harvest the outer leaves, new leaves will fill in, keeping the plants fresh looking and lush. You can grow just about any vegetable in containers. This can be a very creative and ornamental way to design a vegetable garden. Virtually any container will do, as long as it has drainage. Containers can be moved about to take full advantage of the sun. You can plant one type of vegetable per container or mix things up. A downside is that the soil in containers tends to dry out quickly and you may need to water every day. There's no gardening rule that says hanging baskets have to be flowers. Most vegetables will work in hanging planters, too. You may even get a better yield, thanks to the heat that is being reflected back off the wall. You can use any type of container you like, from old buckets to recycled soda bottles, even expensive ceramic bowls. Just remember that the containers will get heavy when they are full of wet soil and fruiting plants. Sometimes you have to think outside of the garden. Many vegetables make attractive bedding plants, especially if they are quick growers and frequently harvested, like lettuce and other salad greens. A shady spot under a tree is the perfect spot for them. Or you could try a row of something like carrots on the edge around a sunny border. Many gardeners know that old, discarded pallets make great compost bins. They also make great vertical gardens. Just staple some landscape fabric to the inside of the front of your pallet and the outside of the rear. Fill the whole thing with some good potting soil. Then turn the pallet on its side and make slits where you want to insert your plants. If you are going to be hanging your pallet garden, make sure you have sturdy hooks, because all that soil and wood will make it very heavy. A simple crate is all you need to plant a salad garden that will feed you for weeks. This is really a variation on a raised bed garden, but since it's self-contained, it's portable. It's too heavy to lift when full, but if you were to put wheels on it, you could move it to wherever the sun decides to shine.